Giles Parker and his wife, Amanda Tyler Parker, arrived in Geneva in 1823 and settled into a home on Castle Street. They had eight children, seven sons and one daughter. The Historical Society fortunately received some Parker family papers in 1977 from Dr. Robert Doran, giving us the opportunity to learn more about this family. Three of the boys, Ira, Stephen and Edgar were all publishers and involved with the social life of the City leaving a trail of newspaper articles and documents that give us insight into their lives. Ira Parker and Stephen H. Parker purchased the office and plant of the original Geneva Gazette, which went out of business in 1839. Ira would divest himself of his share of the business because of poor health and by 1852 Stephen was the sole owner of the paper. It is harder to find information on Ira than it is on Stephen and Edgar. We know that Ira and his wife had twin daughters; Emma married Charles T. Redfield of Towanda, PA in 1868 and Ella, married J. Seymour Wilcox, also of Towanda, PA, in June of 1869. Another daughter, Maggie J. Parker also married a man from Towanda, PA by the name of Means W. Watts. We are told that Ira was a “large” man and that he died in 1883. Many references are made in the newspapers to the fact that the Parker brothers were all large men. In Giles Parker’s obituary printed in the Geneva Gazette in February 1874 reference is made to Stephen, Edgar and four other large sons, with their weight often printed in an article referencing one of them. This did not impede their success though, as Ira went on to be elected Justice of the Peace in 1869, and Police Justice in 1871, he was appointed 1st clerk by the Collector of Canal tolls in 1876 and again nominated for Justice of the Peace in 1877. He was also elected Vestryman of St. Peter’s Church in 1877 and Police Justice (again) in 1879. According to the Geneva Gazette he was also supposed to attend to naturalization applications. Obviously, Ira was very involved with his community and respected. Ira’s brother, Stephen was another Parker devoted to his community and family. Not only was he editor and publisher of the Geneva Gazette from 1849 until his death in 1901, he was appointed Chairman of the convention of Democratic delegates to the 1852 Congressional Convention. He was also appointed to the position of Post Master in 1853, only to be relieved of duty in 1854 and then reappointed in 1857. He was nominated to run for the New York State Assembly in 1854 and when he did not win the election, he was nominated to run again in 1855. The newspaper reports he got into a physical altercation with the editor of a rival paper, the Geneva Chronicle, in 1862. He had a libel suit filed against him by C. L. Hemiup in 1873. S. H. Parker was definitely a noticeable Geneva personality. Stephen went on to help start the Geneva Savings Bank (1874), he was chair of the Centennial Committee (1876), appointed to the post of Health Commissioner (1878), chair of the Philharmonic Society (1878), a member of the Geneva Cemetery Commission (1879), president of the Choral Union (1879) and an accredited Delegate to the Ontario County Democratic Convention in 1878. Stephen’s first wife, Mary died in 1858 having given him five children: George, Carolina, William, Stephan D. and Freddie. He married a second time to Anna Stainton who bore him more three children: Florence, Winnie and Evans. 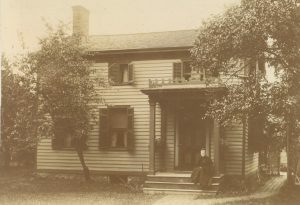 The family lived at 119 North Main Street in Geneva and the house stayed in the family until the 1970s. The Historical Society is fortunate to have many letters written to Evans by his parents. These letters give some insight into the activities of the Parker family and the Village of Geneva in the 1890s. The letters cover plays at the Smith Opera House, news of St. Peter’s Episcopal Church, Hobart College, the local schools, and travels by train to Rochester and Albany to name a few covered topics. Edgar Parker was the third brother to dedicate himself to newspaper work. 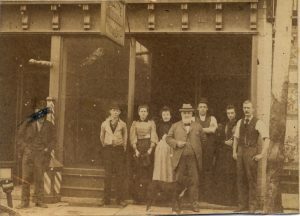 He was a publisher/owner of the Geneva Advertiser and later purchased the Geneva Gazette (in 1901) when his brother Stephen died. 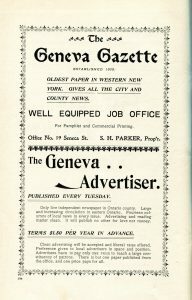 He then combined the Gazette with the Geneva Advertiser, which he already owned to create the Geneva Advertiser-Gazette. Edgar would spend 52 years in the newspaper business until his death in 1914. Edgar was another Parker heavily involved in the City of Geneva; born in the family home at 322 Castle Street, the house remained his home until he died. Edgar got his education in Geneva schools and in 1855 moved to Michigan to help his brother-in-law clear some land. While in Michigan, he contracted what appears to have been malaria, forcing him to return to Geneva for his health. He became an apprentice in Stephen’s newspaper learning enough to encourage him to start his own paper, the Geneva Advertiser, in 1880. One of the original organizers of the Geneva Historical Society in1883, he served as its first president when the small organization revitalized in 1911. The Parker family had a big presence in Geneva and played a large role in the newspaper business of our city for about three quarters of a century. Ira, Stephen, Edgar, their siblings, and children helped shape the Village of Geneva in the 19th Century. Their newspapers left us a window through which we catch a glimpse of the past. Wondering how Dr. Doran got the papers he gave to the Historical Society. Great article with good information. Just one correction, Stephen helped to start the Geneva Federal Savings and Loan in 1874. The Geneva Savings Bank was formed sometime in the early part of the 20th century.